It was as early as 20th century that General Motors started marching their trucks on road. With moving time and the power requirement trucks undoubtedly started gaining attention and thus attracted many automakers to try their hands on, but as we say ‘master is always a step ahead’. 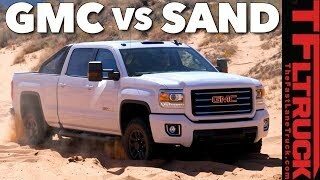 With unveil of GMC Sierra All Terrain HD 2015 company proved it by offering HD 2500 and 3500 trim packages. 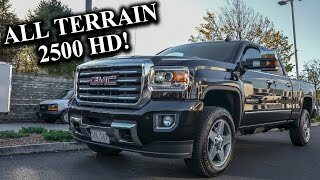 Let us have a look at the review of GMC Sierra All Terrain HD 2015; the new goon from the house of GMC. The interior of GMC Sierra All Terrain HD 2015 for us to an extent kept resemblances with the Sierra 1500 we recently saw. However there are certain upgrades in cabin which will prove to be treating for your eyes with its user friendly look integration and better quality materials. The first thing you’ll notice all around you is the brand badge which reminds you that you are riding a new member from the legend’s house. Company provides you option to get GMC’s IntelliLink infotainment system which features voice recognition, navigation and Bluetooth Connectivity. Also there are five USB ports inside that deliver 110-volt of power to charge your devices on the go. 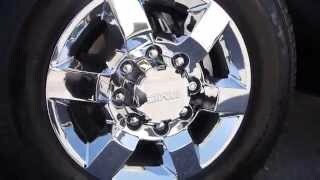 The exterior of GMC Sierra All Terrain HD 2015 is sporty and aggressive. With its front face mounted with a massive chrome grille amidst the LED and HID headlights while the lower portion has the chrome-accented bumper. Further the signs of chrome can be noticed over the towing mirrors, door trim and running boards that make it look beyond comparison. The body of GMC Sierra All Terrain HD 2015 comes with integrated bumper steps and under-rail bed lighting. 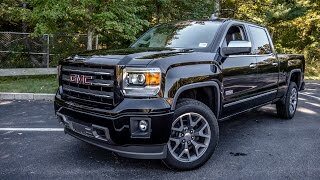 In all you can find lot of lighting and elements, including the backup sources and chrome accents flanking the over all appearance of GMC Sierra All Terrain HD 2015. 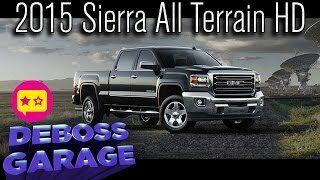 Beneath the hood of GMC Sierra All Terrain HD 2015 buyers have two drivetrain choices; a 6.0 liter V8 gasoline engine that comes as standard and the option to go for a 6.6 liter Duramax turbodiesel V8 engine. While the former creates total output of 360 hp and peak torque of 515 nm paired to Hydra-Matic 6L90 six-speed automatic transmission, the latter generates total output of 397 hp and peak torque of 1037 nm mating to Allison 1000 six-speed transmission.